TORONTO, Nov. 29, 2018 — (PRNewswire) — Genius 100 – a community of pioneering humanitarians – have printed the world's first 3D book: Genius: 100 Visions of the Future. 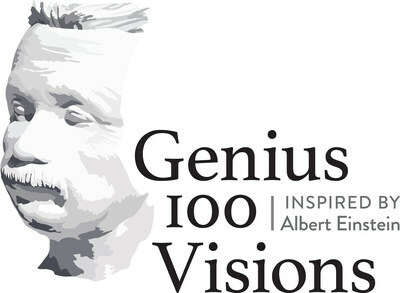 To celebrate the 100th anniversary of Albert Einstein's groundbreaking General Theory of Relativity, Genius: 100 Visions of the Future assembles essays from 100 of the most eminent global thought leaders of our time on their unique perspective of the fast-approaching future. A century-in-the-making publishing milestone, the project, which was prototyped in space, will inspire and enable the next generation of brilliant minds. Genius: 100 Visions of the Future was first conceptualized through a partnership with Canadian Friends of Hebrew University (CFHU) and renowned industrial designer, artist and architect, Ron Arad to honour the legacy of Albert Einstein, who co-founded The Hebrew University in Jerusalem. With the vision of creating a book that would embody Albert Einstein both visually and intellectually, 100 global visionaries were carefully selected from multidisciplinary fields across science, art, literature, business, law, and more. Examples of contributing Visionaries include award-winning actress and singer, Barbra Streisand, bestselling author and renowned pioneer in integrative medicine, Deepak Chopra, human rights activist and 2018 Nobel Peace Prize recipient, Nadia Murad, award-winning novelist and writer, Chimamanda Ngozi Adichie, zen master and global spiritual leader, Thich Nhat Hanh, and multiple-award-winning classical music conductor, Zubin Mehta (full list of Visionaries and bios available here). "Spearheaded by Ron Arad and CHFU's President and CEO Rami Kleinmann, The Genius 100 team set out to do what seemed like the impossible: produce a book that pushed technological boundaries while sharing the wisdom of 100 diverse and dynamic thought-leaders from around the globe," says Julie Toskan Casale, Head of Business Development at Genius 100. "To see this project come to life through the first ever 3D printed book is an incredibly proud moment for the Genius 100 community, an unprecedented initiative that truly speaks to our goal of inspiring creative minds across the globe." 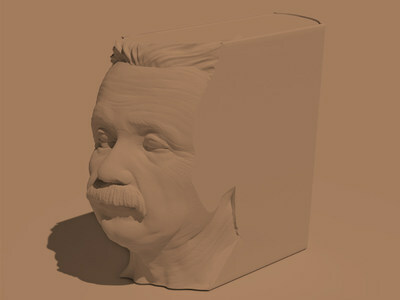 Designed in the likeness of Einstein, Genius: 100 Visions of the Future is the world's first ever 3D book; printed and bound layer-by-layer through the laser-printing process. Three hundred books will be created one-by-one, each book taking approximately one week to complete. The initial prototype was printed at the International Space Station in collaboration with NASA, the Japanese Space Agency, and the European Space Agency. Visionaries will receive their own copy, with additional copies allocated to Genius 100 Founders – entrepreneurs, leaders, and innovators in their own right who have invested in Genius 100 projects. One copy will be signed by the Visionaries and auctioned off next year. Additional plans to celebrate the book and its Visionaries include global signing ceremonies, as well as a launch event taking place at the Sigmund Freud Museum next year. Beyond the book, the overarching objective of the Genius 100 community is to establish a worldwide network of changemakers across the fields of arts, science, space, leadership, technology, business and more. The Genius 100 community have already begun fostering relationships and are working in close collaboration with Visionaries to bring new and meaningful innovations to the world. Interview opportunities with the Genius 100 team are available upon request. Genius 100 is a global community focusing on solutions to major issues. Inspired by Albert Einstein, it's comprised of purpose-driven leaders in their respective fields who seek to make a meaningful impact on the world. With 12 Nobel Laureates and a global who's-who in science, business, the arts, medicine, education, technology and philanthropy, Genius 100 produces events, collaborations and educational material focusing on change and innovation. Its inaugural project consists of the world's first 3D book, titled Genius: 100 Visions of the Future, which showcases essays by the 100 Visionaries. For more information, visit genius100visions.com. Founded in 1944 by Canadian philanthropist Allan Bronfman, CFHU's mandate is to promote awareness, leadership and financial support for The Hebrew University of Jerusalem (HUJI). HUJI was founded in 1918 and opened in 1925 by Albert Einstein, Sigmund Freud, Martin Buber and Chaim Weitzman whose genius inspired a university that would have no limits or borders. Ranked as one of the world's leading research universities, HUJI lies at the forefront of the international academic and scientific communities. As of 2018, 15 Nobel Prize winners, two Fields Medalists, and three Turing Award winners have been affiliated with the University.